There are a few basic steps that will help you create a neat, organized garage. Last time we discussed the first step, creating related zones in your garage. We discovered why it makes sense to create separate zones for auto accessories, household supplies, garden tools, garbage and recycling bins, tools and workstations and sporting equipment. Now let’s discuss how to keep the items in each zone neat and organized by using a variety of tools and accessories designed just for this purpose. Maybe you’ve never heard of slatwall, but you’ve probably seen it in your local retail store. It wasn’t the item being sold. However, it was likely used as the base for the baskets and hooks that held merchandise. Slatwall (also called slotwall and slat board) isn’t limited to use by retailers anymore. 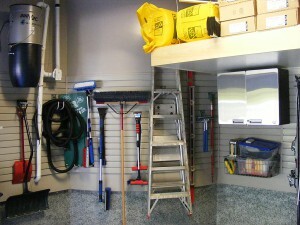 It is frequently used in garages as a hanging system that enables homeowners to get everything off of the garage floor. Slatwall comes in panels which are installed on the walls of the garage. The grooves in the slatwall hold hooks, baskets and other organizational products and give the homeowner the freedom to easily move these items as needed. Your local big-box store might sell a basic slatwall system. However, slatwall sold there is typically composed of MDF. It doesn’t have the durability and weight-bearing capacity of sturdier, PVC-based slatwall available to professional garage renovation specialists and other contractors. Getting professional-grade slatwall installed provides the base for organization in each zone of your garage. Once professional-grade slatwall panels are installed on your garage walls, corresponding baskets and hooks can be inserted into the grooves. These baskets and hooks will provide wall storage for everything ranging from garden tools and sports equipment to snow shovels and bicycles. Just think of all of the possibilities! Rather than the garage being a dumping ground for everyone’s in-line skates or softball equipment, each item can be hung neatly in its designated spot. You won’t spend half an hour searching for your snow brush when the first snow of winter hits unexpectedly. Instead, you can walk right over to the automotive zone in your garage and take the snow brush of its hook. Best of all, since the hooks and baskets can be easily moved, you can adjust the configuration to better accommodate the items you’re storing at various times of the year. Slatwall can also accommodate shelving. Like the corresponding baskets and hooks, the shelving used with slatwall can also be relocated at any time. This provides endless possibilities for storage on your garage walls. Shelving can be particularly useful when it comes to storing window washing fluid, automotive fluids, household chemicals or flower pots. Create shelves high on the wall to store items that should be kept out of the reach of pets and children. Create low shelves for items that should be easily accessible to children. One area frequently overlooked for garage storage is the space overhead. However, with a bit of imagination and essential expertise, the overhead space in your garage can safely store household items that aren’t frequently accessed, like seasonal tires, holiday decorations or roof racks used for carrying luggage or sporting equipment. Bicycles, kayaks, leftover wood or siding and other large, bulky items can also be stored overhead with the right custom solutions. Overhead storage solutions can be tricky to handle on your own. A variety of factors must be considered: height, clearance and weight-bearing capacity, to name a few. If you aren’t completely confident about designing and installing heavy overhead storage solutions, contract a professional garage renovation specialist to handle a job of this magnitude instead. You can purchase any number of pre-built storage cabinets, workbenches and overhead shelves for your garage at your local big-box store. However, you’re limited to the sizes and configurations that they have available. If you have unique challenges in your garage, like curved walls or odd spaces, you might find it difficult to incorporate pre-made storage cabinets into your space. However, a garage renovation specialist can assess your space and custom-build cabinetry and workbenches to perfectly fit your lifestyle as well as the unique spaces of your garage. An organized, functional garage is only a few steps away. Start by creating related storage zones. Then, give everything a specified place within its zone. And finally, be sure to return items to their designated spaces after each use. Want the gorgeous garage, but don’t quite have the time to make it happen? Contact a professional garage renovation specialist to explore the possibilities.